This year at Apache we’ve seen a resurgence in “fitness fashion”, with customers flocking to sporty menswear brands like Gym King and Sik Silk. The latter has lead the charge of new and innovative British brands, with Fila delighting our nostalgic buyers with its decades-long heritage. 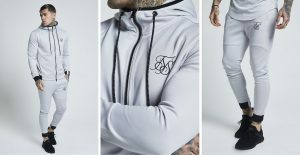 We’ve picked out five of the best new arrivals from these two popular brands, spanning a whole range of fitness fashion styles, from stylish tracksuits to classic velour jackets. Save 10% on all Fila and Sik Silk gear with the code FITNESS1 at online checkout. This lightweight and stretchy tracksuit (it’s called “Agility” for a reason) comes in two parts which can be bought together or separately. The paneled hoody features a “double ended” zip opened from either top or bottom, plus a drawstring hood for a bit of extra snugness. There’s also two mesh lined pockets with a side slant entry, and the black cuffs feature a printed rubber Sik Silk logo. The skinny fit track pants are made from the same soft touch stretch polyester and also feature a drawstring and self-coloured logo cuffs. Here’s one to get you noticed this winter! 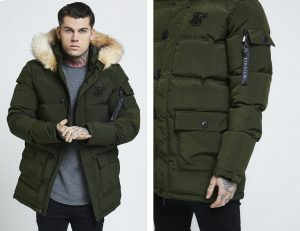 Sik Silk’s heavy duty Puff Parka Jacket features a chunky button-and-zip placket and generous quilted padding to keep out the wind and rain. There’s two large fleece-lined pockets at the front with buttons for security, as well as a smaller pocket on the left arm with a decorative side zip. But the highlight has to be the majestic faux fur hood; nothing like a comfy lion’s mane to keep your bonce toasty warm! Available in Small to Extra Large. This super-stretchy style has sold fantastically well in Black and White, and is now available in Vapour Grey (pictured) for Sik Silk’s Autumn Winter 2018 collection. Made in a classic semi-slim fit, its the perfect T-shirt for sporty guys or gym fanatics to show off their efforts! The taped logo cuffs have a touch of elastic which compliments the snug fit around the upper body. The trademark Sik Silk curved hem also features. Get in now in your size from Small to Extra Large. 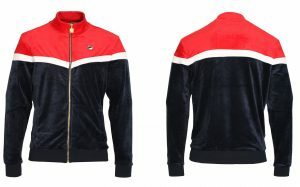 This unashamedly retro tracktop by Fila boasts a distinctive velour fabric with a nice velvety feel to it. Fila tops were a common sight on British streets in the 1980s and 90s having exploded in popularity after John McEnroe & Bjorn Borg’s epic tussles at Wimbledon, further established by football casuals culture. The new “Linekar” track tops stick to that tried and trusted Fila formula with soft 280GSM velour fabric and sporty sleeve piping. Available in Peacoat/White and Tred/White in Medium to Extra Large. 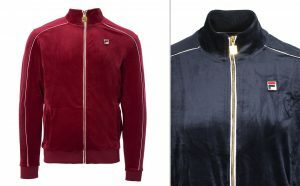 Another soft velour jacket, the Harry tracktop just oozes sports heritage with its bold panel detailing, made in a high quality “cut and sewn” method. There’s a sporty multi-colour tipping under the neck for an extra twist. Buy it now in Medium to Extra Large. Remember to use our exclusive offer code FITNESS1 to save 10% on all Sik Silk and Fila fitness fashion!